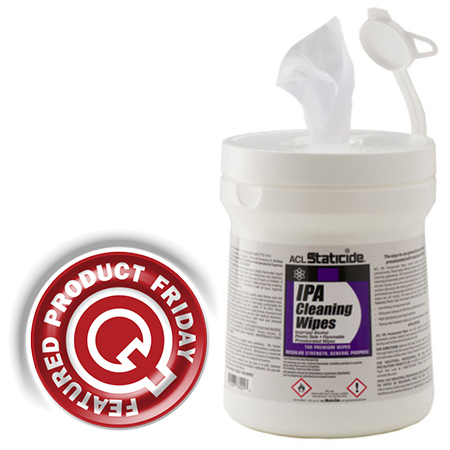 Get ACL Staticide’s IPA Presaturated 5" x 8" General Cleaning Wipes in a 100-count canister (Q Source SKU: 7600-A008) at 33% off the MSRP when you use our FPF013015 Coupon Code. This Featured Product Friday (FPF) promo is valid from today, January 30, 2015 through Sunday, February 1, 2015. These IPA Wipes (7600) are saturated in a pure electronics-grade isopropyl alcohol and are safe to use on plastics and metals. They are perfect for removing solder paste, inks, adhesives, flux residues on printed circuit boards (PCBs), hardline cables, metal/fiber-optic cable splices, and automatic/semi-automatic printer stencils. Regularly listed at $17.95, but with our FPF code savings you’ll get them for just $12.00. While this is a 3-day limited-time price, the coupon is unlimited. Use the code as many times as you like while it is valid—and please feel free to share the code with your friends and colleagues. For further questions about Featured Product Friday, please read our informational blog post, call us (800-966-6020), or send us an email. Please note: This promo is valid only at QSource.com and expires on February 1, 2015. UPDATE: Q Source is closed today, Tuesday, due to the blizzard and on-going snow removal. Please stay tuned for further info. 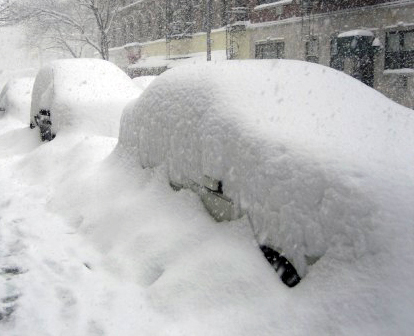 The Q Source office will close at 2 p.m. today due to the approaching blizzard. The storm is forecast to dump two to three feet of snow in our area and the blizzard warning extends through tomorrow night. Depending on the snowfall and safety of the roads, our office may be closed on Tuesday and possibly Wednesday. Refer to this blog and our social media posts for further information. QSource.com remains available 24/7 for orders and product information. Thank you for your patience and we’re sorry for any inconvenience. Please contact us via email if you have any further questions. Leading off this week, coffee lovers rejoice! Workrite Ergonomics shared this post about a study that shows coffee lowers the risk of a deadly skin cancer. Transforming Technologies’ post says sharks are older than trees. Impressive, but sharks can’t climb trees to bite us so…trees win! This post by Laughing Squid about permanent damage being done to King Tut’s golden burial mask had us shaking our heads in disbelief. This throwback post by NIST reminds us that before WWII, “computers” were rooms full of humans…including many female pioneers. Mashable’s post showing 100 humanoid robots performing a synchronized dance routine in Tokyo was cute and entertaining at first, but then we started to think about “Terminator” and things weren’t so funny anymore. And we close out this week’s column with our blog post about the all-in-one organization solution: Quantum Storage Bin Shelving Units. 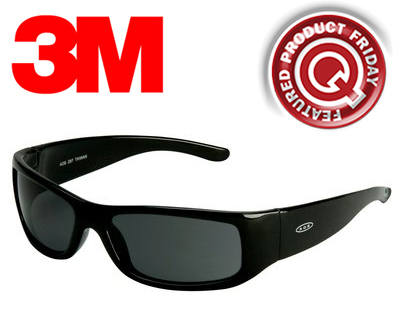 Get a case of these 3M Moon Dawg Standard Protective Eyewear w/Clear Lenses & Black Frames (20 per case) (Q Source SKU: 11215-00000-20-S036) at 20% off the MSRP when you use our FPF012315 Coupon Code. 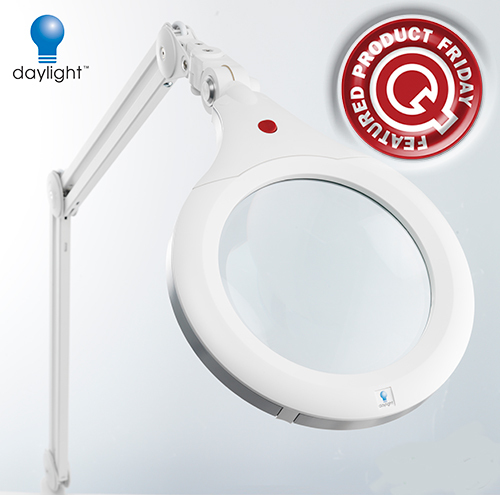 This Featured Product Friday (FPF) promo is valid from today, January 23, 2015 through Sunday, January 25, 2015. These surf-inspired safety glasses (11215-00000-20) are lightweight, durable, and have lenses that absorb 99.9% UV and meet the high-impact requirements of ANSI Z87.1-2003. 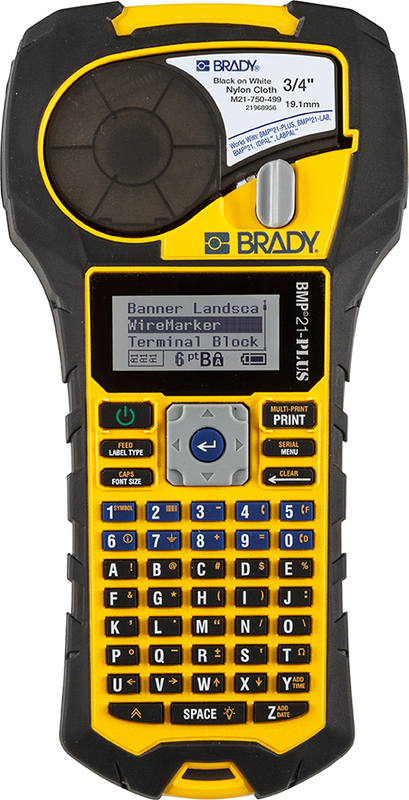 Regularly listed at $188.47, but with our FPF code savings you’ll get it for just $150.00. While this is a 3-day limited-time price, the coupon is unlimited. Use the code as many times as you like while it is valid—and please feel free to share the code with your friends and colleagues. For further questions about Featured Product Friday, please read our informational blog post, call us (800-966-6020), or send us an email. Please note: This promo is valid only at QSource.com and expires on January 25, 2015. Creating an organized workplace storage area doesn't have to be difficult or expensive. QSource.com recently added 440 Quantum Storage Bin Shelving Units that provide an all-in-one solution for getting organized. Quantum Storage's complete shelving systems help you boost accessibility while keeping parts organized and fit right in to picking or inventory control applications. 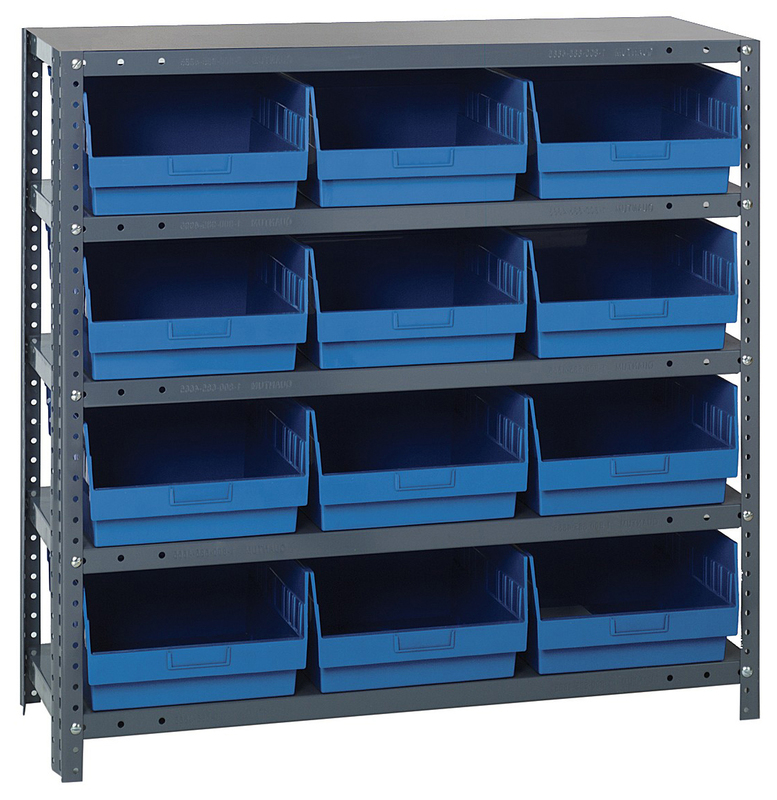 An easy-to-read bin label area makes for quick identification and the steel shelf units provide long-lasting durability since they will not rust or corrode. Shelf Capacity: 350 lb./400 lb./475 lb./750 lb. Check the specific series for available features. For help choosing the right bin shelving unit for your needs, please give one of our material handling/storage experts a call at 800-966-6020. They'll be happy to assist you. To purchase a complete shelving unit, please visit our Quantum Storage Bin Shelving Unit page at QSource.com. You may also contact us via our Web site, by phone, or via email. Please note: Due to the size and/or weight of this item, freight charges will not be calculated at checkout. We will need to contact you to arrange shipping. Leading off this week, Fashion Seal HC posted one viewpoint on the question of requiring bodycams for healthcare uniforms. EE Times shared this encouraging post about smartphones for the blind. This post by Laboratory Equipment magazine blew our minds. Read about how a tiny speck of plutonium from the Manhattan Project wound up on the UC Berkeley campus. Check out this ThomasNet post to learn about Kenshiro, a University of Tokyo robot that resembles the build of a 12-year-old boy and boasts 160 artificial muscles. 3D Printing Industry shared this post about how 3D printing technology is being used in complex heart surgery. And we close out this week’s column with our email post introducing the new All American Series workbenches by IAC Industries. Have you heard about the new All American Series by IAC Industries? QSource.com is honored to have been selected to be one of the select sites offering this high-quality line of lower-cost, durable workbenches and accessories. The All American Series is exclusive to dealers and distributors like Q Source. These ruggedly built, Quick Value benches feature heavy-gauge steel, durable powder-coat paint, and are made in the USA. Even better, you can order up to ten benches and get them in just 5 to 10 business days. Once again, Q Source, for a limited time, has been chosen as a select distributor for the All American Series products. We're excited to be working with IAC to bring you this high-quality, lower-cost solution for workbenches and accessories. To place an order (or for further information), please visit our All American Series by IAC Industries Web page or contact us via email, phone (800-966-6020), or the Contact Us page at QSource.com. Get this Transforming Technologies Gray ESD Chair Mat/Floor Runner (48" x 60") (Q Source SKU: FM4-4860-T070) at 14% off the MSRP when you use our FPF011615 Coupon Code. This Featured Product Friday (FPF) promo is valid from today, January 16, 2015 through Sunday, January 18, 2015. 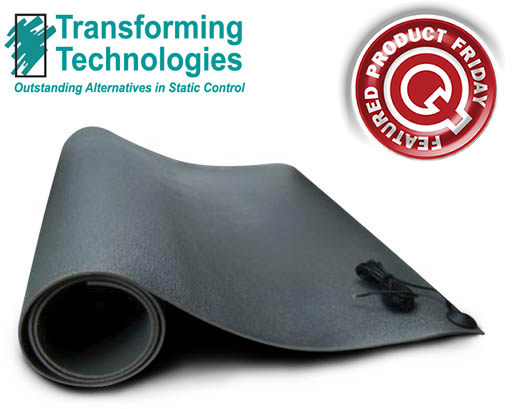 This ESD Chair Mat/Floor Runner (FM4 4860) is a durable ESD mat made from rigid, solid vinyl with a buried conductive layer that provides consistent electrical properties. Regularly listed at $256.31, but with our FPF code savings you’ll get it for just $220.00. While this is a 3-day limited-time price, the coupon is unlimited. Use the code as many times as you like while it is valid—and please feel free to share the code with your friends and colleagues. For further questions about Featured Product Friday, please read our informational blog post, call us (800-966-6020), or send us an email. Please note: This promo is valid only at QSource.com and expires on January 18, 2015. Leading off this week, EE Times’ post had us thinking about how all these new Connected Cars communicate to each other. Solving the challenges of speed, weight, etc. seem to be a key issue for 2015. We love learning the history of gadgets and enjoyed this Popular Mechanics post about 10 accidental discoveries of awesome things like microwaves and Velcro. Did you know that Illinois is the largest producer of nuclear energy in the U.S.? This post by Laboratory Equipment magazine presents 6 things you didn’t know about nuclear power. Did you hear about the tool that was 3D-printed on the International Space Station after being transmitted from Earth? Robot Magazine’s post tells you how you can get those plans to 3D-print your own space wrench. MAKE Magazine shared this post about a beautiful stained-glass version of Optimus Prime. Does this mean there’s a Church of the Transformers? 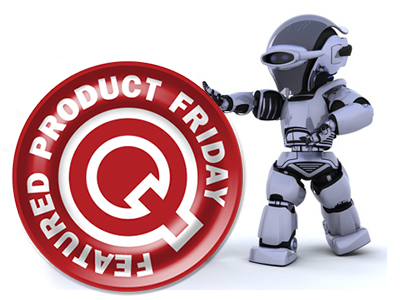 And we close out this week’s column with our post about our Featured Product Friday promotion and our plans for 2015.